The move to abolish annual employee performance reviews within the entire Adobe organisation is famous within the company. In 2012, a senior executive met with a journalist from The Economic Times of India after a long flight. While the interview covered many topics for the fast-growing software company, it was the Executive Vice President of Customer and Employee Experience’s ideas on HR that became front-page news the next day. Donna Morris admitted she had been agitated and sleep deprived from the flight and had not meant to share her personal view that the annual performance review had become a painful and unproductive process. She says she was planning to vet that point-of-view with her CEO and colleagues, but the comments became front-page news under the headline “Adobe Set to Scrap Performance Review”, and the story subsequently spread around the world, forcing Morris to fast-track the change. Fortunately, the rest of the organisation was compelled by the proposal, and the company quickly moved to an ongoing “Check In” process between managers and their direct reports. For V.R. 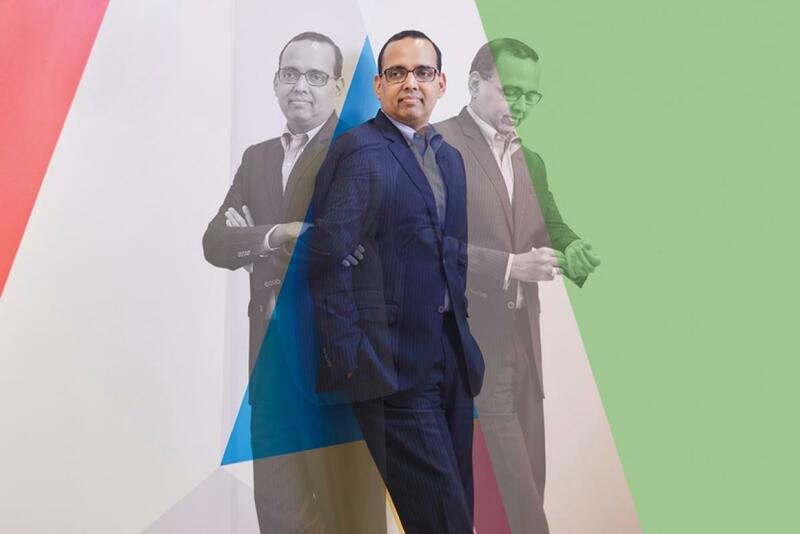 Srivatsan, Managing Director, Adobe Southeast Asia, it represents a much more engaging and effective system, with managers empowering staff to take control of their own careers. “The fascinating thing about the check-in process is that it creates flexibility, drives productivity and empowers employees to take their careers into their own hands,” he says. A veteran of over 26 years in the software industry, Srivatsan has certainly taken his career into his own hands. He began it in the US in the early 1990s with the much larger technology firm Oracle, before moving to Singapore in 1993. Since then, he’s been based within the Southeast-Asian region, assuming senior posts for the likes of SAP and Autodesk Asia. He became Adobe’s Managing Director for Southeast Asia in July last year. You’re a huge advocate of digital transformation and simultaneously improving customer experience. Can you talk us through this thinking? The first thing is to realise that the world is changing. We use different gadgets and those things keep evolving. The expectation of the consumer has also evolved. People are not patient anymore, and they want the best possible experience. We at Adobe believe that going forward, the biggest competitive differentiator and the way you succeed in the market will be by managing your customer experiences. This doesn’t just entail marketing – it’s everything. If you’re a business that does not handle your customer experiences well, you will face many challenges. This whole world of digital transformation is driving everybody to take care of that customer experience. There’s no such thing as brand loyalty anymore; it’s about customer experience. The reason why we have many success stories among the larger organisations is because these companies have handled customer experience better than others. The transformation is happening where everybody wants to go digital. At the core of it is how you drive the end-to-end customer experience so that you can differentiate from your competitors and build that loyalty and relationship with your customers. These two go hand in hand. And how are you leading Adobe’s efforts on these fronts? We’re blessed with some really market-leading solutions. We have transformed ourselves successfully from being the best producer of content through our creative cloud software, to now providing our customers with the most meaningful solutions to drive the customer experience. We have a whole variety of solutions around what we call the “experience cloud” which helps drive that. The good news is that the solutions are already built-in, and many of our global and regional customers use them. What I focus on is the execution part of it. How do we take these world-leading solutions and make the actual customer experience even better? A lot of it really comes down to making sure that every aspect of how we touch our customers in Southeast Asia leads them to have the best possible experience beyond just products and into services. Donna Morris, Adobe’s Executive Vice President of Customer and Employee Experience, famously abolished the company’s annual performance review in 2012. Tell us more about the “Check In” approach. What we’ve done with this check-in process is we’ve eliminated this approach of doing an annual performance review, rating employees, drawing up a typical bell curve, and ranking employees. We now have conversations between employees and managers in what we’ve called “Check-ins”. This occurs at whatever frequency is appropriate for the two. This has saved a lot of time and improved productivity for both managers and employees. But most importantly, it’s empowered employees to take career management as their own initiative. Every person’s career is their own choice. They’ve got to plan what they want for their career. Then, the manager becomes a facilitator. If somebody walks into my office and says that they want to do that role, my job becomes a lot easier because I don’t need to second guess what that individual wants to do. I can then assess if the person is capable and to coach and guide them. While the manager becomes a facilitator, the ownership of career progression goes back to the employee. The fascinating thing about the Check In process is that it creates flexibility, drives productivity and empowers employees to take their careers into their own hands. Has this led to improved retention levels within Southeast Asia? The IT industry is always difficult, but I am very happy to report that our retention rates are one of the best in the industry. The check-in process has certainly contributed to that. We feel that it plays a very important role in employees having a “feel-good” factor around the organisation’s policies. Adobe gets ranked very highly in the Best-Employer-to-Work-For studies globally. There are many other parameters that drive retention, but the Check In process definitely contributes to employees feeling empowered and having the opportunity to do different things. We all know that in the IT industry, there are big changes every few years. It’s a fast-moving transformation and the roles that exist today did not exist several years ago. It’s really important for those in the formative years of their careers to carefully think through what they want and the Check In process has really facilitated that. People feel they have options, more control and empowerment over what they potentially want to embark on. It clearly results in better satisfaction and therefore contributes to a higher retention level. What are some key workforce challenges of Adobe? We are in an industry where talent is always a challenge. Companies are jumping into this digital-transformation bandwagon; everyone wants to embark on it. A couple of years ago, it was a nice-to-have item. Now, it’s a must-have in most boardroom agendas. It’s an area which we continuously work hard in to ensure we have the right talent which is enabled and to provide the value-added functions to drive customer experience. We also have a tremendously diverse organisation. We have many different types of software solutions and there is always the challenge of making sure that everybody is aligned to the common goal – which is to simply grow the business. To me, Southeast Asia represents a story for opportunity. The customers in this region are just beginning to get into this wave of digital transformation so we are focused on building the infrastructure and scaling the business for growth. What do you foresee to be the next “big thing” in the technology sector? People are already talking about them, but things like artificial intelligence, machine learning, virtual reality, and voice and gesture recognition are now coming into play. This philosophy of embedding artificial intelligence into everyday life is definitely making a big wave. This is huge for us because one of the things we’ve done at Adobe about a year ago was to launch a framework called Adobe Sensei. It’s a framework that brings all our artificial intelligence and machine-learning services and solutions together. The interesting thing is that we’ve embedded artificial intelligence into many of our cloud and software offerings. We have many different features that have been wrapped into a framework called Adobe Sensei. It is very powerful because as you interact with systems, it helps create better targeting and better experiences for customers because they are advanced enough to know one’s preferences and desires. Part Two of our exclusive interview with Adobe’s V.R. Srivatsan can be found here. Over 200 HR professionals took part in the inaugural HR Tech Think Tank, hosted by HRM Asia on Friday, October 19. Angry at being fired, a man threw a molotov cocktail into his ex-employer's office.